Last week, I had the privilege of heading down to Amy Tangerine’s studio to film some videos. She has a YouTube channel as well as a great blog and online presence where she specializes in paper arts like scrapbooking and even has her own line of papers and stickers! 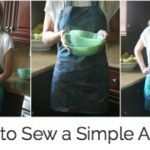 We got together and she helped me learn the basics of scrapbooking, what I should buy and how to get started. I seem to have lots of piles of school photos, printed pictures, certificates etc. that don’t have a home and I am worried they will get lost! I was glad she was able to walk me through some steps to get me started! After we filmed that video which went up on her channel, we filmed the tool roll-up video for my channel. 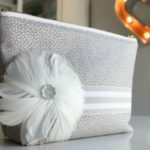 I have had this on my list of tutorials to make for a long time and she loved the idea since it applied to so many different areas of creativity whether it’s make-up brushes, crochet hooks or scrapbook supplies. 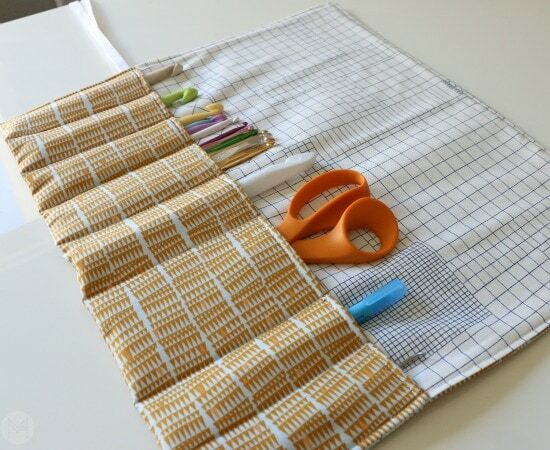 Here is what you need to make the tool roll-up! Also, Check out the video here where Amy teaches me the basics of scrapbooking! Tons of good info! *This contains affiliate links, THANK YOU for supporting what I do so that I can continue to bring you content ;). Melanie and Amy, not only that you both are very pretty but you are skilful moreover. 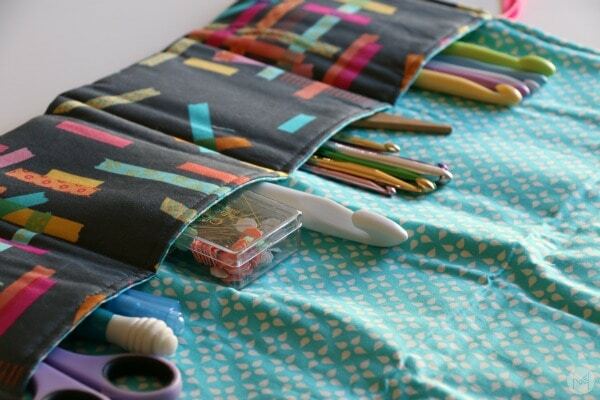 Thank you very much for your tutorial, I will use it for a pencil roll up case, it will be a gift for my colleague. Mirka from the Czech Republic, the same country as Ivana Trump is coming from. What do you do, just flip it up to start the pocket? loved this so much! have never watched Amy Tangerine but now am a subscriber. you are both a pleasure to watch and learn from. Can you show me how to crochet a prayer shawl? I really enjoy your videos.